Question 1: The Lord’s promise is that He will come again to take us into the kingdom of heaven, and yet you testify that the Lord has already been incarnated to do the work of judgment in the last days. The Bible clearly prophesies that the Lord will descend with power and great glory on clouds. This is quite different from what you’ve testified, that the Lord has already been incarnated and secretly descended among men. Answer: You say that the Lord promised man that He would come again to take man into the kingdom of heaven, that is for sure, because the Lord is faithful, He will invariably make good on His promises. But we need to first be clear that the Lord's coming again through incarnation in the last days to do the work of judgment is directly related to how we are raptured into the kingdom of heaven. If we study the Bible closely, evidence of this is not hard to find. In several different passages from the Bible, it is clearly prophesied that the second coming of God is the incarnation. For instance: “Be you therefore ready also: for the Son of man comes at an hour when you think not” (Luk 12:40). “For as the lightning, that lightens out of the one part under heaven, shines to the other part under heaven; so shall also the Son of man be in his day. But first must he suffer many things, and be rejected of this generation” (Luk 17:24-25). All of these prophecies speak of the Son of man or the Son of man comes. This phrase the Son of man refers to One who is born to a human and has normal humanity. So the Spirit can’t be called the Son of man. For instance, because Jehovah God is Spirit, He cannot be called the Son of man. Some people have seen angels, angels are also spiritual beings, so they cannot be called the Son of man. All those that have the appearance of man but are composed of spiritual bodies cannot be called the Son of man. The incarnate Lord Jesus was called the Son of man and Christ because He was the incarnate flesh of God’s Spirit and so became an ordinary and normal man, living in the company of other men. So when the Lord Jesus said the Son of man and the Son of man comes, He was referring to God’s coming through incarnation in the last days. Especially when He said, “first must he suffer many things, and be rejected of this generation,” this proves even more explicitly that when the Lord comes again, He comes by becoming flesh. If He didn’t come in fleshly form but rather as a spiritual body, He certainly wouldn’t experience any suffering and certainly wouldn’t be rejected by this generation, that’s undoubtable. 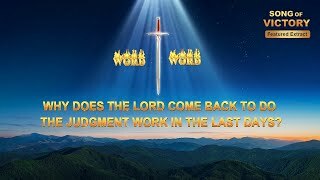 So, the Lord Jesus’ return is definitely in the form of the incarnation and comes to do the work of judgment in the last days. Many people ask: Didn’t the Lord promise that He would come again to take us into the kingdom of heaven? When He comes, why does He still have to do the work of judgment starting from the house of God? Actually, the Lord does the work of judgment to make the overcomers, that is, to rapture the saints. If we look, there is plenty of evidence in the Bible to explain why when the Lord comes in the last days He must do the work of judgment. This prophecy that God will come again in the last days to do the work of judgment appears more than anything else in the Bible, there are at least over 200 instances, and there are many scriptures that prophesy God’s incarnation doing the work of judgment. For instance, “And he shall judge among the nations, and shall rebuke many people” (Isa 2:4). “Before the LORD; for he comes to judge the earth: with righteousness shall he judge the world, and the people with equity” (Psm 98:9). “Saying with a loud voice, Fear God, and give glory to him; for the hour of his judgment is come” (Rev 14:7). “Because he has appointed a day, in the which he will judge the world in righteousness by that man whom he has ordained” (Act 17:31). “And has given him authority to execute judgment also, because he is the Son of man” (Jhn 5:27). “For the Father judges no man, but has committed all judgment to the Son …” (Jhn 5:22). “He that rejects me, and receives not my words, has one that judges him: the word that I have spoken, the same shall judge him in the last day” (Jhn 12:48). “For the time is come that judgment must begin at the house of God” (1Pe 4:17). And there are many others. These scriptures allow us to clearly see that God’s incarnation will surely come in the last days to do the work of judgment. God’s incarnation in the last days works through expressing His word to judge, purify and save mankind. All those that can hear the returned Lord Jesus’ voice and seek and accept Him are the wise virgins who will go with Him to the wedding feast. This fulfills the prophecy of the Lord Jesus: “And at midnight there was a cry made, Behold, the bridegroom comes; go you out to meet him” (Mat 25:6). The wise virgins hear the Lord’s voice and come to greet Him; the next thing they know, they are raptured by the Lord before the throne to come face to face with Him. They accept God’s judgment, purification, and perfection in the last days and finally, through the judgment by God’s words, their corrupt disposition is purified and they are perfected into overcomers. As you can see, if we want to attain that which the Lord has promised, we must first come before Christ of the last days, Almighty God, accept and experience God’s judgment and chastisement in the last days, so as to be purified and perfected by God. If we don’t, then we do not qualify to be raptured into the kingdom of heaven. If it weren’t for the fact of God’s work in the last days, no one would understand how the prophecies in these scriptures have been fulfilled. Yes, God’s incarnation in the last days as the Son of man to do the work of judgment has truly fulfilled these scriptures. Almighty God says, “You only know that Jesus shall descend during the last days, but how exactly will He descend? A sinner such as you, who has just been redeemed, and has not been changed, or been perfected by God, can you be after God’s heart? For you, you who are still of your old self, it is true that you were saved by Jesus, and that you are not counted as a sinner because of the salvation of God, but this does not prove that you are not sinful, and are not impure. How can you be saintly if you have not been changed? Within, you are beset by impurity, selfish and mean, yet you still wish to descend with Jesus—you should be so lucky! You have missed a step in your belief in God: You have merely been redeemed, but have not been changed. For you to be after God’s heart, God must personally do the work of changing and cleansing you; if you are only redeemed, you will be incapable of attaining sanctity. In this way you will be unqualified to share in the good blessings of God, for you have missed out a step in God’s work of managing man, which is the key step of changing and perfecting. And so you, a sinner who has just been redeemed, are incapable of directly inheriting God’s inheritance” (“Concerning Appellations and Identity” in The Word Appears in the Flesh). “Christ of the last days brings life, and brings the enduring and everlasting way of truth. This truth is the path through which man shall gain life, and the only path by which man shall know God and be approved by God. If you do not seek the way of life provided by Christ of the last days, then you shall never gain the approval of Jesus, and shall never be qualified to enter the gate of the kingdom of heaven, for you are both a puppet and prisoner of history” (“Only Christ of the Last Days Can Give Man the Way of Eternal Life” in The Word Appears in the Flesh). “Those who wish to gain life without relying on the truth spoken by Christ are the most ridiculous people on earth, and those who do not accept the way of life brought by Christ are lost in fantasy. And so I say that the people who do not accept Christ of the last days shall forever be despised by God. Christ is man’s gateway to the kingdom during the last days, which none may bypass. None may be perfected by God except through Christ” (“Only Christ of the Last Days Can Give Man the Way of Eternal Life” in The Word Appears in the Flesh). 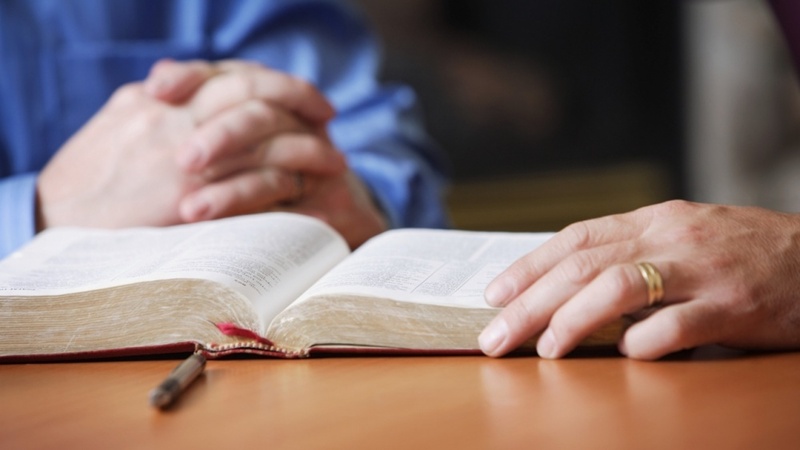 The words of Almighty God already point the way toward the kingdom of heaven. Christ of the last days is the gate to entry into the kingdom of heaven. If man does not experience the work of judgment of Christ in the last days, he cannot be purified and perfected, and will never enter into God's kingdom. This is the authority manifested by the incarnate God. This proves that in the Lord's second coming, He will surely be incarnated in a flesh to do the work of judgment in the last days. God has already accomplished this much. If there are still those that think that they can be raptured into the kingdom of heaven without experiencing God's work in the last days, this is a symptom of their conceptions and illusions, it will never come to fruition. Some people say if the Lord has truly come as the incarnation, then how come many passages of the Bible say that He will come with clouds for all to see? How do you explain this? In the Bible there are several prophecies which state that the Lord will come upon clouds with His power and great glory. This is true. But, there are even more passages in the Bible that prophesy that the Lord will come secretly. For instance: “I come as a thief” (Rev 16:15). “… for in such an hour as you think not the Son of man comes” (Mat 24:44). “But of that day and hour knows no man, no, not the angels of heaven, but my Father only” (Mat 24:36). As you see, there are two ways in which the Lord returns: one way is in secret, the other is out in the open. Which we’ve testified to today, is just the work of the Lord coming in secret. 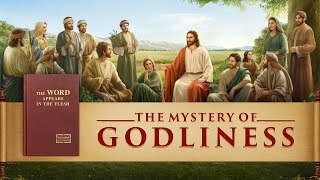 Because God’s incarnation has come among men in the form of a normal, average person, to man, He appears in secret, no one can tell that He is God, no one knows His true identity. Only when the Son of man begins to work and speak do those that can distinguish His voice begin to recognize Him. Those that fail to distinguish His voice will certainly treat Him as a regular person, denying and rejecting Him. Just as when the Lord Jesus was incarnated to do His work, He seemed like an ordinary and normal man in outward appearance, so most people denied, resisted and condemned Him, while some, through the Lord Jesus' word and work, were able to recognize Him as the incarnate Christ, the appearance of God. Now is the stage where Almighty God comes in secret to do His work and save mankind. He is currently engaged in expressing His word to judge, purify, and perfect mankind. At this point, man will certainly not see the Lord appearing in public atop clouds. Only after a group of overcomers have been made and the work of God’s incarnation and secret descent among man is complete, at which time the calamities will visit upon earth and God will punish the wicked while rewarding the good, appearing openly before all the nations of earth. At this time, the prophecies of the Lord’s public descent on earth will be fulfilled, just as is said in the Bible: “And then shall appear the sign of the Son of man in heaven: and then shall all the tribes of the earth mourn, and they shall see the Son of man coming in the clouds of heaven with power and great glory” (Mat 24:30). “Behold, he comes with clouds; and every eye shall see him, and they also which pierced him: and all kindreds of the earth shall wail because of him” (Rev 1:7). When man sees the Lord appearing to all of humanity in public atop clouds, in theory they should be overjoyed, and yet here it says “shall all the tribes of the earth mourn.” Why is this? This is because when God finally appears in public, the salvation work of God’s incarnation during His secret descent among man will already be complete and God will have started His work of rewarding the good and punishing the evil. At this time, all those that rejected God’s secret work will have completely lost the chance to be saved. Those that pierced Him, which is to say, those that resisted and condemned Christ of the last days, Almighty God, how could they not beat their breasts in despair, wail and grind their teeth, knowing that the One they resisted and condemned is the second coming of the Lord Jesus? So that’s how the scene of “shall all the tribes of the earth mourn” will appear. Let’s read another passage of Almighty God’s word. Almighty God says, “Many people may not care what I say, but I still want to tell every so-called saint who follows Jesus that, when you see Jesus descend from the heaven upon a white cloud with your own eyes, this will be the public appearance of the Sun of righteousness. Perhaps that will be a time of great excitement for you, yet you should know that the time when you witness Jesus descend from the heaven is also the time when you go down to hell to be punished. It will herald the end of God’s management plan, and will be when God rewards the good and punishes the wicked. For the judgment of God will have ended before man sees signs, when there is only the expression of truth. Those who accept the truth and do not seek signs, and thus have been purified, shall have returned before the throne of God and entered the Creator’s embrace. Only those who persist in the belief that “The Jesus who does not ride upon a white cloud is a false Christ” shall be subjected to everlasting punishment, for they only believe in the Jesus who exhibits signs, but do not acknowledge the Jesus who proclaims severe judgment and releases the true way of life. And so it can only be that Jesus deals with them when He openly returns upon a white cloud. … The return of Jesus is a great salvation for those who are capable of accepting the truth, but for those who are unable to accept the truth it is a sign of condemnation. You should choose your own path, and should not blaspheme against the Holy Spirit and reject the truth. You should not be an ignorant and arrogant person, but someone who obeys the guidance of the Holy Spirit and longs for and seeks the truth; only in this way will you benefit” (“When You Behold the Spiritual Body of Jesus Will Be When God Has Made Anew Heaven and Earth” in The Word Appears in the Flesh). From Almighty God’s words we’ve realized that the work done by God’s incarnation in the last days during His secret descent among man is a crucial stage of work in God’s perfection of man. In God’s six-thousand-year management plan, this work represents an extremely rare opportunity for God to perfect man. All those that accept God’s secret work and are perfected have received God’s special grace and are the most blessed. If we don’t cherish this extremely rare opportunity and miss out on God’s work of making the overcomers, we can only wail and grind our teeth, cast in the throes of deep regret. Previous：Question 3: Right now, desolate churches are widespread throughout the entire religious world, but we have never fully understood the primary cause. That’s why we’ve been earnestly reading the Old Testament and have focused on how the actions of the Jewish chief priests, scribes and Pharisees in the late Age of Law led to such desolation in religion. Although some problems have been discovered, it’s never been entirely clear. We’ve also gone to churches in many different places and from different denominations, but we haven’t seen the work of the Holy Spirit. We’re not very clear on why the entire religious world is so desolate. What’s the real reason for this? Next：Question 2: I’ve believed in the Lord for over half my life. I’ve worked tirelessly for the Lord and have been on constant lookout for His second coming. If the Lord came, why didn’t I receive His revelation? Has He cast me aside? This has left me very confused. How do you explain this?